2010 Terrelle Pryor > 2005 Troy Smith? Although there is still a game or two left between various college football teams around the country, for Ohio State and its fans, the waiting game has begun. Having put the finishing touches on an 11-1 regular season with a convincing 37-7 victory over Michigan on Saturday, the Buckeyes now wait to see who and where they will be playing in their bowl game. At the moment, the most likely destination is the Sugar Bowl against an SEC opponent (likely Arkansas). But until the bowl selections are officially released, everything is uncertain. Rather than looking forward into the unknown, I thought I would take a moment to look back at how the regular season went for the team. Each year, I have ridiculously high expectations for the Buckeyes in the preseason. So high, in fact, that it is almost impossible for the team or the players to live up to them (thankfully, I have video games to take care of that). I, along with most other Ohio State fans, had particularly high hopes for Terrelle Pryor following the Rose Bowl. So, how has he lived up to those lofty expectations? Read on for a look at Pryor’s 2010 season, how it compares to some previous Ohio State greats (see the title), and some speculation about the future. Since we’ve entered “game week”, it would make sense to highlight Michael Wiley or the great James Laughlin, 1979 team MVP. Actually, since Jim’s blocked punt in the 1979 MACh1gAAn game led to another loss by TTUN, and since we seem to be making a lot of friends from “bluer” websites, let’s take day five in a different direction. 2004- 37 to 21 Troy and Teddy lead to the upset of the #7 team in the nation. 2005- 25 to 21 “The Catch”. 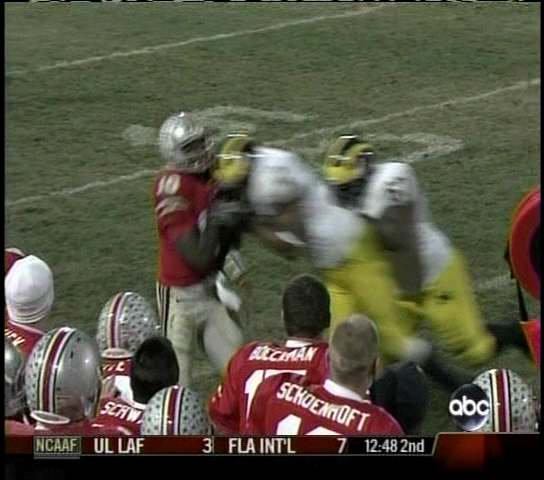 Oh, and the amazing tackle by Shawn Crable on Ohio State’s last score. 2006- 42 to 39 The Game of the Century. #1 vs. #2. Heisman Trophy winner Troy Smith and the Buckeyes win again, with help from Morgan Trent and Shawn Crable. 2007- 14 to 3 All Beanie, All Day. Plus, Jake Long allows Chad Henne into the Gun Show that is Vernon Gholston. 2008- 42 to 7 Goodbye, Beanie. Hello, Boom and Terrelle. Just think, if they hadn’t been breaking all of those practice and training rules, they would have been shut out. To be honest, the best thing about day five is that next year we’ll be able to use this template for countdown day six. We had a couple of interesting pieces to publish today, so the countdown had to wait until the street lights went on….thanks for your patience! There’s only ten days left until the Ohio State Buckeyes take the field for the opening game of the 2009 season. Now is the time that you begin to literally taste the excitement. You can begin to smell the air in Ohio turning crisp, that genuine aroma of fall that you don’t truly recognize if you’re not from the midwest. To me, that is the actual essence of college football. Day #10 could have had so many great athletes recognized here at The BBC. Rex Kern, QB from the legendary teams of 1968-1970. Or we could just go with the guy that still thrills us all here in Ohio and still gives them nightmares in that state up north. Yeah, let’s go with Troy Smith. Ohio State football has long been a force, and no single man can be credited with being the savior of the game (well, maybe Woody). But earlier this decade things did not look so good for us until Troy Smith returned the Buckeyes to greatness. Justin Zwick was our quarterback in 2004, and we struggled a lot with him at the helm early on. It actually took a 55-yard FG at the buzzer to beat lowly Marshall. More than half of Zwick’s passes ended up incomplete or in the hands of our opponents. Then the losses started coming. An OT loss to Northwestern showed just how bad things were about to get. The murmurs about removing Zwick for Smith began to turn into screams. The next week, a loss at home to Wisconsin started Buckeye fans into panic mode. 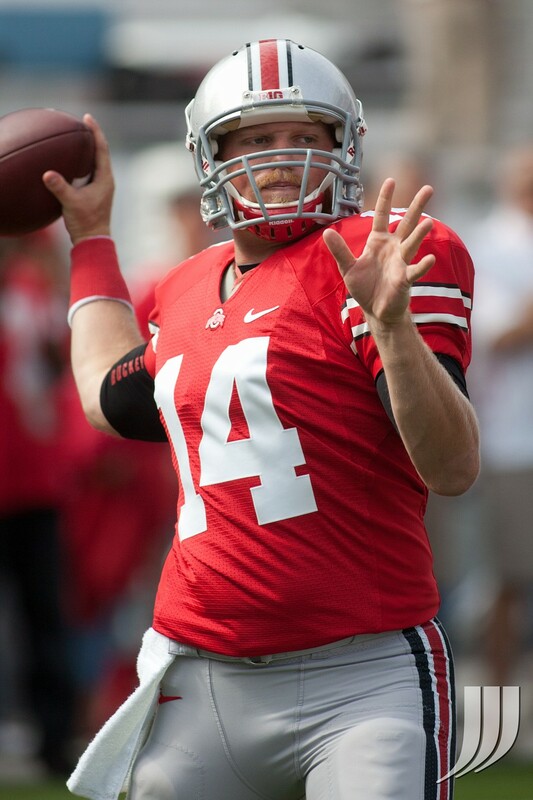 Tressel felt the heat to make a switch at QB. Against Iowa, with the Buckeyes trailing 17-0, Zwick fumbled the ball deep in his own territory, and the change was made. Troy Smith took over during Ohio State’s worst slump in over a decade and the weight was now on his shoulders. Smith won 5 of the remaining 6 Buckeye games in 2004, turning a 3-3 Zwick team into an 8-4 Alamo Bowl champion….and a complete destruction over #7 Michigan, 37-21. In 2005, his starting record was 9-1, which included a come-from-behind win at Michigan 25-21 and a 34-20 Fiesta Bowl win over Notre Dame. Then came the dream season of 2006, in which the Buckeyes ended up 12-1. Smith’s final home game was known as the “Game Of The Century” between #1 Ohio State and #2 Michigan. Guess who won? Wanna know just how much we love Troy Smith in northeast Ohio? We actually didn’t mind that he got drafted by the Baltimore Ravens. Smith’s record as a starter was 25-3. He became only the second QB ever to go 3-0 against Michigan. He gained over 1,000 yards….against Michigan alone. But none of those stats are as pretty as it is to actually watch the man in action. Thank God for YouTube…. Troy Smith, thank you for all you did for us. This day is for you.